"grand, expansive voice ... like a rich Columbian coffee blend"
Her 2017 performance of Mary Magdalene in Elgar’s The Apostles with American Symphony Orchestra at Carnegie Hall was “sung with great depth of feeling and luxuriant tone ... One of the evening’s high points was her intense performance” (Opera News). 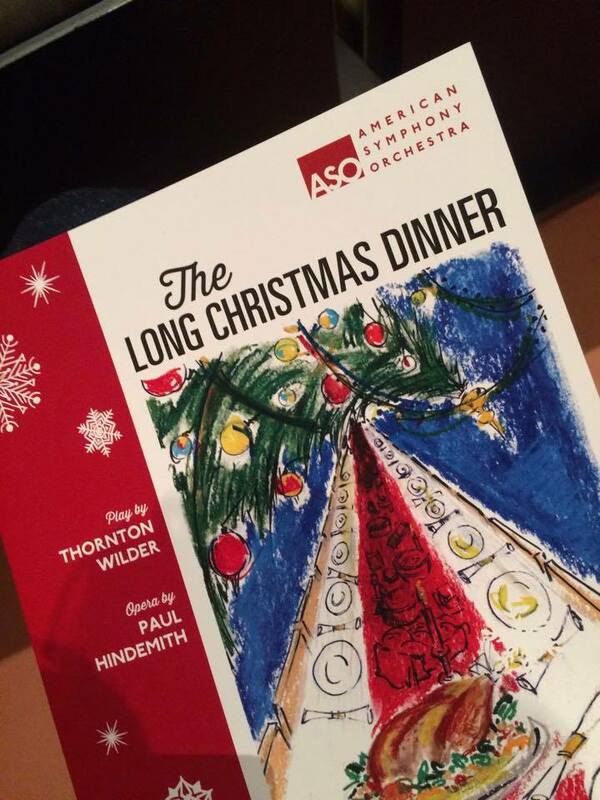 Sara portrayed Mother Bayard and Cousin Ermengarde in Hindemith’s The Long Christmas Dinner with American Symphony Orchestra at Lincoln Center, the live recording of which topped The New York Times’ Classical Playlist and was one of Opera News’ Best Recordings of the Year in 2015. "Mezzo Sara Murphy plays both Mother Bayard, who has a nostalgic reverie in the first scene, and cousin Ermengarde, who is left alone at the end to sing a final meditation, which Murphy renders with exquisite poignancy." "Sara Murphy’s closing aria as Ermengarde here is marvellously poignant." 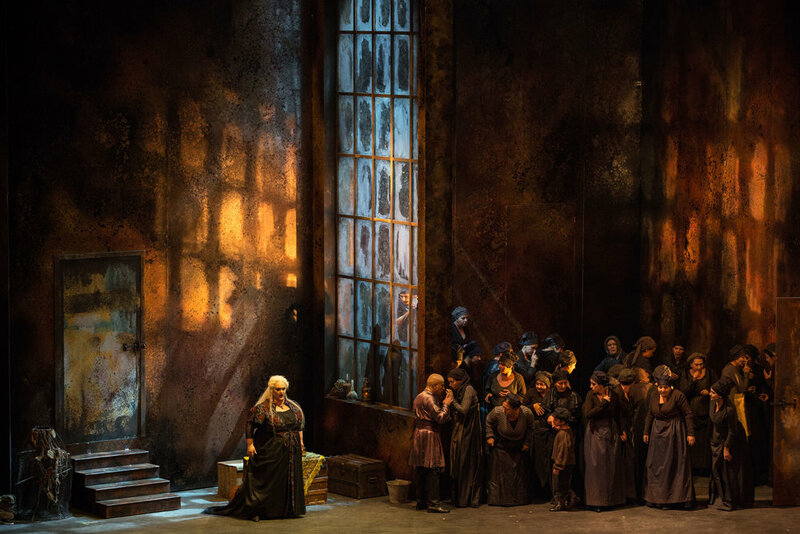 "Among the highlights of the Bridge recording is Mother Bayard’s quiet, complacent ariosa in the first scene, sung beautifully by Sara Murphy, a dramatic mezzo-soprano who also played the role of Cousin Ermengarde. Making a clear vocal delineation between the two characters, Murphy brought the performance to an affecting end with the spoken final line. In response to “They’re building a new house,” a line from a letter she reads, Ermengarde speaks two words after the orchestral accompaniment has faded away: 'Fancy that!'" "Sara Murphy as Ermengarde, who ends the opera imagining the family continuing without her, [is] a bit special." Newly released recording of The Long Christmas Dinner makes the top of Arts Beat's playlist in the New York Times. 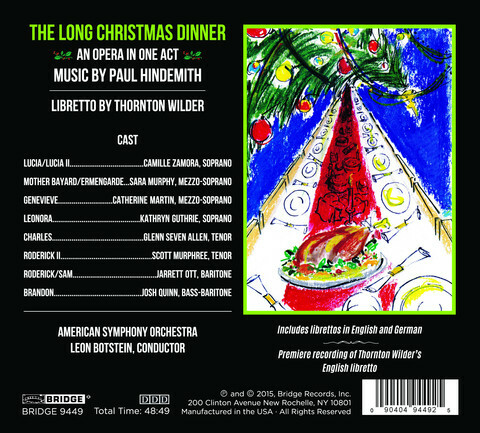 This recording marks a major event in American music: the premiere recording of the original English language version of Paul Hindemith's final opera, “The Long Christmas Dinner” (1960/61) on a libretto by Thornton Wilder. Conductor Leon Botstein writes: “One aspect that Thornton Wilder and Paul Hindemith shared was their mastery of the short form in their respective fields: the single-act work. Nowhere is Wilder’s skill in this dramatic form so ambitiously and thrillingly demonstrated than in “The Long Christmas Dinner”, which transforms the concept of duration by compressing 90 years into under an hour, and thereby exposes fundamental issues of life and its rebirths. Hindemith, too, loved the form, and used it to invoke sudden spikes of emotion, whether it be horror, laughter, or astonishment. That these two great artists collaborated on a form that they both dominated and reinvigorated is a rare and happy historical convergence.” This CD release includes complete librettos in English and German, and extensive background notes by Hindemith scholar Joel Haney, conductor Leon Botstein, and Tappan Wilder, nephew and literary executor of Thornton Wilder. "great depth of feeling and luxuriant tone"
"a gorgeous, deep dark mezzo-soprano"
"a rich, voluminous mezzo voice, excellent diction and an acute feeling for words and music"
"her grand, expansive voice was like a rich Columbian coffee blend"
“Jesus appears at decisive moments ... But the real leads are his two tormented followers: Mary Magdalene and Judas. 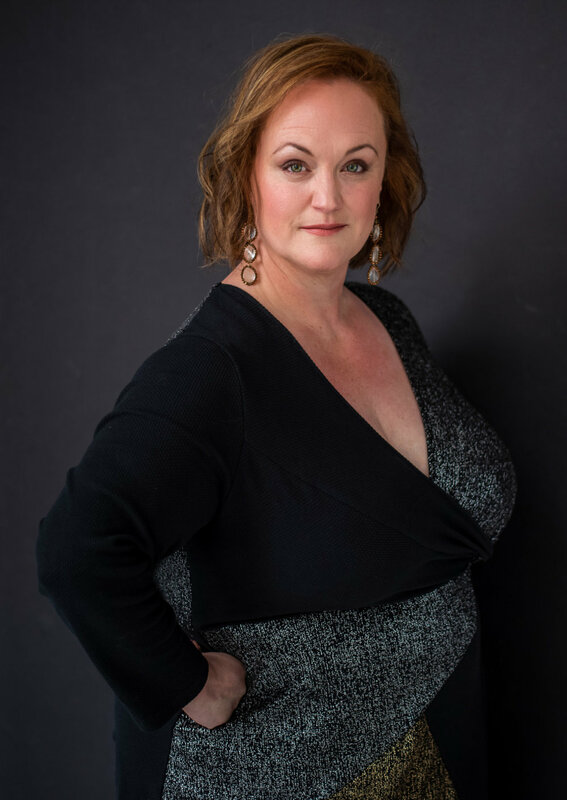 During an intense scene, Mary (the rich-voiced mezzo-soprano Sara Murphy) expresses abject shame over her sinful past and desperate longing for forgiveness. "The mezzo-soprano Sara Murphy was a superbly sung Mary Magdalene and Narrator in Part 2. Hers is a large, booming voice with strong alto-ish bottom and an easy top." “The soloists all sang at a high level. There was no weak member of the group. 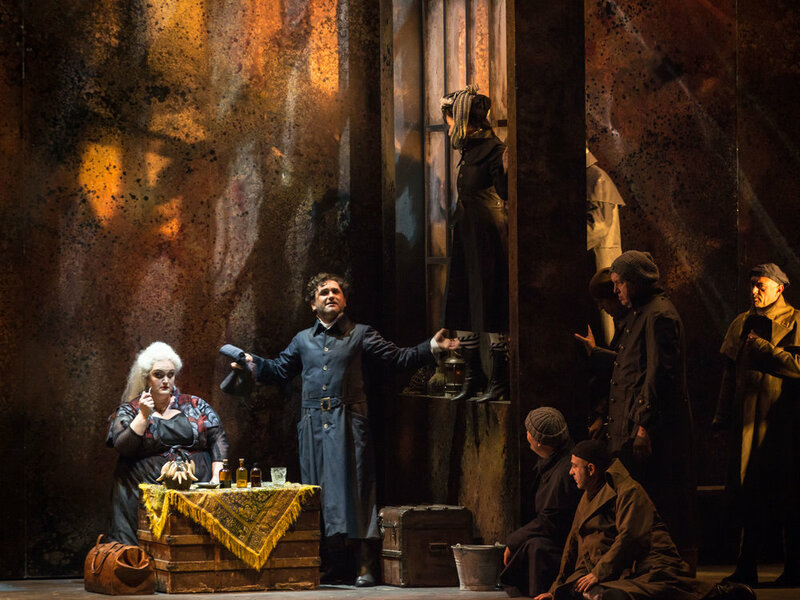 Two of them deserve special praise, however: Sara Murphy, who sang Mary Magdalene in a melodically controlled, but deeply emotional manner and Alfred Walker as Judas, using the rich and varied colors of his bass-baritone voice to combine expressive phrasing with eloquent feeling. It was those two sinners who fascinated Elgar the most, and casting, singing, and direction rendered it most eloquently. "La breve ma intensa parte dell’indovina Arvidson è stata affidata a Sara Murphy voce piuttosto potente molto adatta alla peculiarità della parte." The brief but intense part of the medium Arvidson (Ulrica) was entrusted to Sara Murphy with a rather powerful voice that was very suitable for the particularities of the role. "Sara Murphy impressed in each of her appearances, from her deeply felt 'Woe unto them who forsake Him' to her powerful Jezebel, the biblical queen who drives Elijah into the wilderness. As the angel, her message to Elijah 'O rest in the Lord,' was heartfelt and comforting." Murphy challenges the view that "day job" and performing are in opposition to each other. She sees more and more singers moving away from viewing the two things as opposites, as either/or. "I view it as a happy 'and' in my life." "A high point in the concert came in a finely-crafted 'aria' which Schnittke assigns to a solo mezzo-soprano voice. Tonight Sara Murphy expanded on the excellent impression she had made in the Ligeti: her voice has depth and warmth; it's even and glowing throughout the range, and fills the hall effortlessly. Her singing has a rich emotional resonance which derives from the sound itself, free of theatrical embellishments. This was some of the most soul-pleasing vocalism I have heard in the past decade. She was enthusiastically cheered as she took her bows." "The mezzo-soprano Sara Murphy sang with poise and emotive force in the ominous third movement." Equally brilliant–without any reservations whatsoever—were Mezzo-soprano Sara Murphy and Soprano Jennifer Zetlan. Their challenge was to make the huge octave-and-a-half leaps, to sing in minor-seconds with each other (perhaps even microtones! ), to keep not only perfect pitch but to allow each note to have its own change colors and vibratos. "Sara Murphy ... another force to be reckoned with ... Her grand, expansive voice, was like a rich Columbian coffee blend—smooth—but bracing, as she used her superb diction to enunciate the sorrows of "He Was Despised." "Sara Murphy was an earthy, motherly presence as Mother Bayard and Cousin Ermengarde." "The rich-voiced mezzo-soprano Sara Murphy was especially endearing as Mother Bayard and, later, Cousin Ermengarde." "...[B]oy howdy, mezzo Sara Murphy is worthy of my most enthusiastic raves. Her Lux aeterna was lyrical and full of drama at the same time. Her Liber scriptus has set a new standard by which I shall judge all other performances of Liber scriptus. Her performance was sensitive musically and completely on the mark vocally, her sound always beautiful and free. Why is this lovely woman not singing everywhere? I would compare her to Amnerises and Adalgisas with world-class careers today, and she'd win." [The] American Sara Murphy [was] absolutely unforgettable for her versatility and ability to conquer any sensitive soul."